The fashion press and beauty bloggers from around the world agree that Egyptian Magic is a “must-have” skin cream for leaving your skin incredibly soft, smooth and blemish-free. Many often start using Egyptian Magic to treat a skin problem such as a rash or burn or scar, and then continue using it as a skin moisturizer and as an anti-wrinkle skin care cream. We find that using it twice a day does wonders for creating soft, smooth skin. And this, of course, is one of the key reasons Egyptian Magic is so popular among the fashion and movie industry as a beauty cream for face and skin care. Some users keep an extra jar of Egyptian Magic in their first aid kit exclusively as a treatment for burns, scrapes, skin irritations and the like. Since Egyptian Magic will stay fresh indefinitely, you can store it for an extended period of time without concern for it losing effectiveness. Users have also commented on Egyptian Magic’s “magical” ability to heal scars. Although it’s not recommended for older scars, many users believe Egyptian Magic can indeed work wonders to minimize relatively recent scars and skin discolorations. Egyptian Magic is popular among many plastic surgeons, who recommend it to their patients for accelerating the healing of plastic surgery scars. For many customers, one of the most delightful discoveries is how beneficial Egyptian Magic can be as a moisturizing hair conditioner – either on a regular basis or as a conditioning hot pack. Egyptian Magic’s all-natural ingredients will restore luster to your hair and replenish its natural oils. 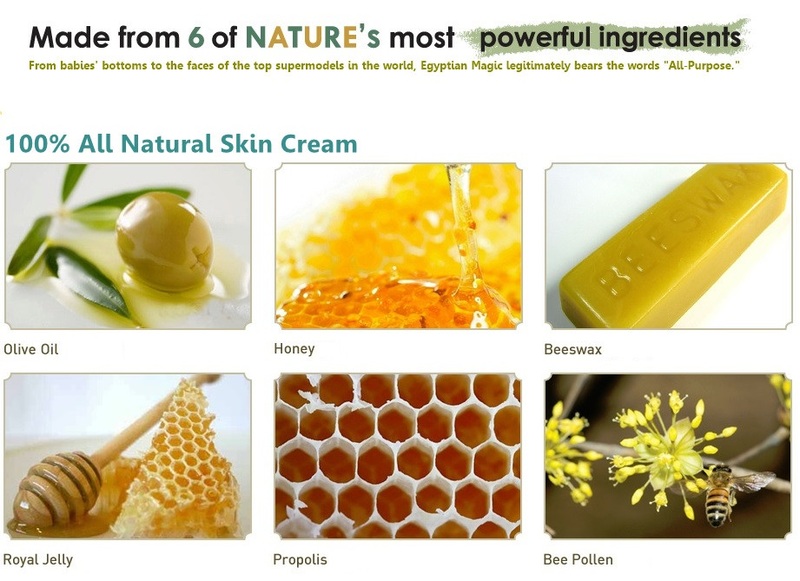 We find that about one-third of users discover Egyptian Magic after looking to natural alternatives to commercial moisturizing creams as a treatment for eczema and psoriasis. Though different in nature, both of these conditions can often be treated by the twice-daily application of a moisturizing cream, according to several authorities. All-natural Egyptian Magic is an ideal choice. Tag your photos using #nattacosme[free5pcse on Instagram!